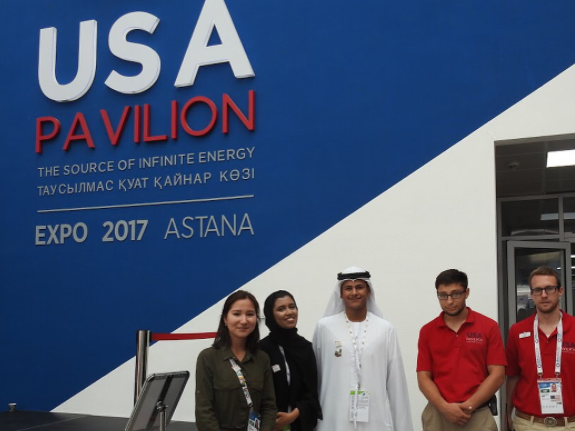 Today the US Pavilion welcomed Khoolood and Mohammad, two volunteers from the United Arab Emirates Pavilion. UAE has a setup similar to ours, with student volunteers helping to run the show. One difference is that these volunteers rotate out, with a new group taking their place every month or so. Khoolood and Mohammad have just a few weeks left in Astana. After an introduction to our exhibition, Alex and Priya took off to fill their shoes at the UAE Pavilion for a few hours. After being greeted by Hassan, the team leader, Alex and Priya were treated to a tour of the UAE Pavilion that concluded with delicious dates and Emirati tea (Chai Karak). Next, work began. Amna, Hamad, and Abubakar, translating and engineering students from the UAE, showed us the ropes. From posing for countless photos to writing children’s names in Arabic on their arms, we saw how interested Kazakhstani visitors were in the dress and culture of this faraway land. However, my favorite moments were the quiet conversations that occurred in between the waves of guests. When Grace visited later in the day, she too was given a tour of the pavilion. She especially admired the calming aesthetic of the main show room and the friendly hospitality of the volunteers. At the end of the visit, Khoolood and Mohammad presented each student ambassador a pin.